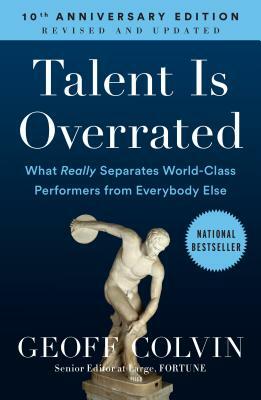 Since its publication ten years ago, businesspeople, investors, doctors, parents, students, athletes, and musicians at every level have adopted the maxims of Talent Is Overrated to get better at what they’re passionate about. Now this classic has been updated and revised with new research and takeaways to help anyone achieve even greater performance. Why are certain people so incredibly great at what they do? Most of us think we know the answer—but we’re almost always wrong. That’s important, because if we’re wrong on this crucial question, then we have zero chance of getting significantly better at anything we care about. Happily, the real source of great performance is no longer a mystery. Bringing together extensive scientific research, bestselling author Geoff Colvin shows where we go wrong and what actually makes world-class performers so remarkable. It isn’t specific, innate talent, nor is it plain old hard work. It’s a very specific type of work that anyone can do—but most people don’t. What’s more, the principles of great performance apply to virtually any activity that matters to you. Readers worldwide have been inspired by this book’s liberating message: You don’t need a one-in-a-million natural gift. Better performance, and maybe even world-class performance, is closer than you think.